Saturday I travelled to Buckinghamshire to race the renowned Roy Thame Cup which was a 76 mile National B on a relatively flat course, with what can only be explained as the worst road surface ever. Punctures played a major problem from the start along with bottles bouncing across the road. Due to the high winds the bunch was strung out instantly with gaps being made for a brutal first hour of racing which saw the field get smaller and smaller. Unfortunately for me, I didn’t have the legs after the first 90mins and suffered with stomach cramps which saw me abandon the race 2hrs in. Never a nice feeling to not complete a race, but it’s bike racing and some days don’t go to plan. Thankfully team mate Ryan got in the break and came across the line in 9th place. In an attempt to redeem myself from Saturday, I raced a local e123 crit at Maindy on Sunday. An early attack in the first lap established the lead group as 5 of us lapped the bunch. Wind again playing a huge factor in this race which some riders felt better with than others. A counter attack went, with 2 riders which I missed, so I spent the race chasing with 2 others but nothing was coming of it. I attacked the other 2 and went solo to the finish coming across the line in 3rd place. This performance is what I needed to boost the morale and the sensations felt good smashing it around local crits. Next up is the Betty Pharoah Memorial. This is a local Nat B for me in Cowbridge, it’s on a rolling circuit and could be interesting. There are some big names and teams racing with Madison Genesis putting out a full team with the likes of current British National Road Champion Connor Swift and also Canyon dhb with a full team. Only team mate Ryan Watkins and I will be racing this race for TBW23 Stuart Hall Gett Taxi, and we will both be looking for top results and race aggressively. Arriving at the race and seeing the big teams rock up was amazing as me and Kieran were looking forward to getting stuck in, I met Kieran before the race so I could get a few bits and bobs. The weather was a bit of a shock with the winds being at the strongest point 40mph so with a quick change of my front wheel to something shallower we were ready to race after a quick warm up. The race started really fast in the 2nd cat group catching the 3rd cat group within 2 laps, 30seconds gap gone almost instantly. Then the elites caught us this instantly upped the pace as Every one wanted to get on there wheel, this and the crosswinds meant people may have lost concentration and the crashes started to happen after some questionable riding, Kieran then got involved in a big crash meaning his race was over. I was sat mid bunch after this point where a rider had stopped and no one had said anything but then swung out leaving me not knowing someone was stopped, didn't have enough time to react and went straight into the rider and crashed. Unlucky first proper race for both of us, looking forward to the next race to try and bag a result! It’s been a few months since my last blog. After the Tour of Tobago I had 5 weeks off the bike, 3 of which were spent in Bali . I normally only have 2 weeks off after the season but I thought I’d try something different this time and it’s seem to have worked so far. The weather itself wasn’t to bad over December which was when I started back on the bike. Half my time was spent in the gym focusing on strength, conditioning and core work and the other half on the road. The weather did take a turn halfway through January, luckily enough though I jetted off at the start of January to altea in south Spain and spent just over 5 weeks there. There I built a solid base with a lot of long efforts in. I also applied a no stop rule to all my rides which certainly has helped, well because you can’t stop in a race can you? Far to many people go to Spain and sit in the cafe longer than they ride . Now back in the UK, not for long though, I have a few local races to start the season then in the first week of April I’m off to do the Tour Ta Malta, in Malta lol. My aim is to win the GC on this race as I know I’m more than capable of doing so especially after the winter and current form that I have. I’ll be riding for the same team this season which is TBW Stuart hall cycling Botteechia. Long name, we have a lot of foreign races planned which is what I love and aim to do well in. I will he support by the Lewis Balyckyi Trust Fund. A huge shock when I got the call again and totally grateful for there help and support over the past few years. I believe this will be by far my most successful and I can’t wait to race. Again thanks for this season support it really makes all the difference enabling riders to be full time on the bike. Also thanks for to my coach Roy Holmes of Holmes cycling for putting up with my late ride uploads and being my personal mechanic. Thanks Roy! 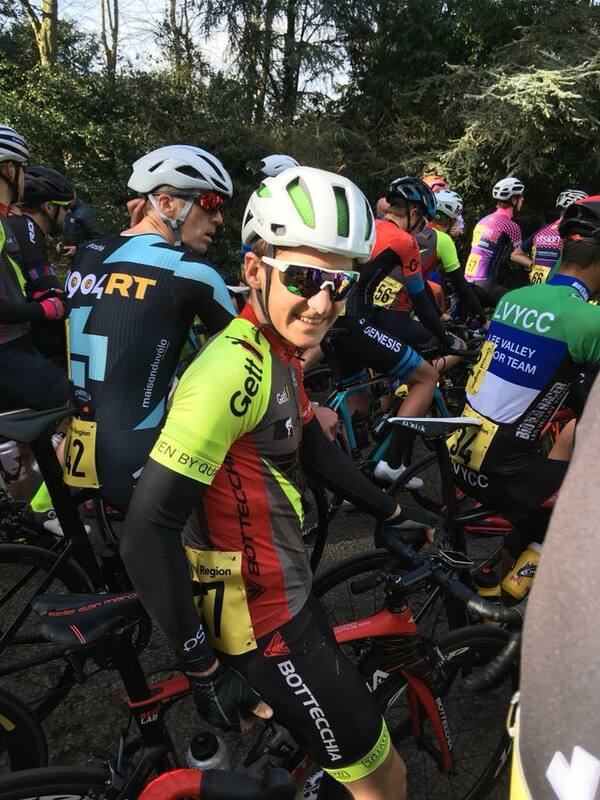 On Sunday, the team raced the SERRL Wivelsfield Kermis. @stanley @harry @peter @alex started strong being one of two well fielded teams. Paul Newsome of Project 51 gradually extending the gap to 58 seconds. Further attempts were made by riders within the peloton to form a chasing group, however with a strong presence from @TBW23 and @Project51 at the front, attempts were quashed. Heading into the final lap, Peter attacked with 4 kilometres to go, holding the lead into the final 200 meters. With approximately 100m to go Peter was caught by Declan Egan, who went on to take the win. Peter finished 2nd in what was a great effort to try out sprint Declan. Harry Horsman coming in 9th and Stanley Kennett 29th. So in June 2018 I went for a health check up (with an ECG) and found out I had a heart condition called Wolff-Parkinson-White syndrome. It’s an electrical pathway problem in the heart. In most cases it isn’t an issue unless you also develop Atrial Fibrillation. The combination of the two can have serious, potentially life threatening consequences. So on 5th Feb 2019 I underwent the surgical procedure to remove the extra electrical pathway in my heart. But it was agreed with the surgeon in advance that if the pathway was found to be too close to the center of the heart the risk (which is small) would not be taken of possibly ending up with a pacemaker for the rest of my life. Goes without saying. that’s not ideal for a competitive cyclist. Unfortunately this was the scenario that played out. The surgeon did not take the risk. Moving forward I will have to make decisions about what I’m going to do to take control of this issue. Weighing up the odds, consequences and benefits of returning to the procedure and taking the risk or living with a risk. Since my last post, I’ve made slow but steady progress with the injury to my left patellar. I’ve pretty much built back the strength in my left leg, up till the point where it is as strong as my right. This has involved plenty of time at my local PureGym lifting weights & overgearing (churning a big-gear) efforts on the bike, combined with smashing lots of tasty grub. I won’t be racing until 2019 so calorie counting is the last thing on my mind, and it’s important that I rebuild my muscles as quickly as possible. Furthermore, both eating enough and weightbearing exercise is really important for cyclists to ensure they don’t develop osteoporosis (reduced bone density). So my off-season efforts have additional bonuses. I really enjoy the gym so that works for me but climbing, jogging, or hiking with a backpack can be great ways for cyclists to preserve bone strength. They’re also all good ways to keep fit off the bike and to spend time with non-cyclists. The first of these was a three-day tour with my good friend Rob, who I’d made whilst living in York. We’d be riding from London – York. With our parents living in each of the cities, we knew that at the very least we’d start and finish with a home-cooked meal. For me it was also a fitting farewell to York – a city I’d studied in for the past three years, riding with a friend I’d made over that time. After Rob came down on Monday evening, we set off bright and early on Tuesday. From London, I guided us through the Chilterns on familiar roads. But after lunch in Bicester, we were trusting in the faith of our pre-plotted route. Disappointingly, the best part of the ride seemed to be through the Chilterns, with the second half being fairly flat and mundane. But with only a few miles to go, we upped the pace and soon reached Stratford-Upon-Avon. We rode into town for a bit of sightseeing and stopped-off to pick up two oven pizzas which were soon demolished at alarming speed in the youth hostel garden. Day two we headed north again. There didn’t seem to be a lot north of Stratford, but we managed to find the café I’d meticulously researched. With so much countryside, I was anxious that we found somewhere with an espresso machine before the day was out. Once we’d caffeinated-up, we were at the edge of the Peak District before we knew it. The last 10 miles were pretty draggy with heavy legs and with some climbing to do for a change but eventually we crossed the day’s imaginary finish-line at Youlgreave. We were frustrated to find we’d arrived before the hostel had opened. We didn’t know it yet but this was a blessing in disguise. To kill some time, we explored the village and stumbled upon the brilliant Peak Feast; a homely café tucked away off the main street. The sort of place you can fill your boots with homemade goodies for pennies. After laying in the sun outside in a fatigued cake-coma, we checked-in and cooked a second, savoury dinner in the hostel kitchen. The sun was still strong in the sky so strolled down to the local pub for a few drinks. The last day through the peaks proved to be the best riding, and our route took in lovely climbs at Froggat & over the Strines. The steeper of these provided good strength training for my atrophied left leg, especially riding my heavy winter-bike laden with panniers. We made it through the hilly stuff and eventually onto the Vale of York- much flatter terrain which was highly convenient after 300 miles in our legs since Tuesday morning. After passing ground zero, where I’d crashed a dozen weeks previously, we arrived in the city and were welcomed by the Gray family like two long-lost sons. It’d been a “mega” trip and I was also pleased with how my knee had held up, given that it hadn’t been too long since I’d been back riding. After a week or so back at work in London, the next trip was a little less wild. This was mostly due to the fact I would be going with my sister (who preferred not to lug her wardrobe around with her) so we would be staying in an Airbnb as a base and riding out each day. She’d only been on a road bike for a matter of months, but after county-level running as a teenager and a rigorous rowing training regime at university she was already well up to speed, and proved to be a great riding partner. She’s shaping up to be a handy racer herself, especially on the track, so hopefully she’ll provide a good training companion for future trips. We stayed in Matlock, a useful spot to explore the south peaks. We had some beautiful rides, ticking off some famous climbs I’d yet to conquer, and giving my sister a taste for the magic of Yorkshire roads. On the last morning we squeezed in a quick 40km spin before breakfast. Somehow I managed to take us up the lung-busting Riber hill on the way home; we were certainly ready for some food after that! Funnily enough, the companion for my next adventure is from Matlock. Except that I’m sure he doesn’t find Riber nearly so painful, as he only weighs about 50 kilos! Oli Smee is a rider I’d met guesting for Team OnForm at the Tour of Sussex a few years back. We’d got on pretty well as team mates, and kept in touch. Now he wanted to kick start his winter training with some touring. We’d decided to ride from York to Edinburgh, which gave me the perfect excuse to abuse the endless hospitality of the Gray household. They put us both up for the night and we set out into a mammoth headwind to Langdon Beck hostel on the edge of the Pennines. Jamie Gray had recommended a refuel at the Dales Bike Centre in Reeth, and having experienced some of his culinary masterpieces first-hand, I knew a café recommendation was not to be missed. The wind was pretty relentless throughout the day, and instead of flying down the descent towards Reeth, we crept at a comical pace down the steep descent much to my stomach’s displeasure. After a well overdue brew & munch we headed back out into the gale for another few hours crawling. We had a much-needed lie-down in Langon Beck before day two: over the Pennines and through Northumbria. This was easily the best riding I’d ever done in the UK. On par with Yorkshire but untouched; no traffic to spoil the picturesque roads. Luckily enough Oli had got in contact with James Jobber, a local hitter, to give us a tow around some of the lanes. We arrived in Wooler feeling a bit less nailed than the day before, and after watching the sunset cosied up around the fire in the hostel. The final day was the shortest, and after crossing the Scottish Border we called an early coffee stop to push us up the one climb on our route. It proved a good call because before we knew it we arrived at the top, and were greeted by the stunning Whiteadder Resevoir. We had to stop and get off the bikes for some photos. It blew us away. After that, all we needed was a cheeky Irn-Bru to get us to Edinburgh and up Arthur’s Mount. That evening we met up with my sister who is currently doing a PhD at Edinburgh university, and as we relived our tale over a hearty Scottish meal, we realised how brilliant the tour had been. Despite the headwind, the constant, strong headwind. I’d love to do more trips like these but often I prioritise racing and more structured training. But after this racing season turned into a write-off, I knew that it’d be a great time to do some of these trips, given that fitness level isn’t really a limiter in this kind of riding. However, I was pleasantly surprised with the data from my powermeter when I took a moment to look back on the rides; maybe it had been good training after all! Last, but not least, was a trip down to the Steyning, a lovely village tucked away behind the South Downs in Sussex. I’d tactically invited myself to the Aiton household, some close family friends, to get out of London and explore new roads. I’d done a little bit of riding there before, when I’d visited previously, and had been in the area plenty of times with my family since my Grandad lived in Steyning until he died. However, I’d been on Google Maps far too much and had been eyeing up some exploits in the Downs. Both the Aitons & the Downs were very welcoming, and I enjoyed the best part of a week yomping all over Sussex. Either riding leafy lanes, or chasing Oscar the Jack Russell on some “recovery” walks. Some of the roads were fairly busy but given how close it is to London, I couldn’t recommend it more as a spot for a long weekend of cycling or suchlike. Outside of riding my bike I also Graduated from University in June, and I can be doubly pleased. I’m proud of the achievement, but also it opens a new chapter in my life. An exciting chapter which is already taking shape… But that’s for next time. Stay tuned. So a few weeks back ‘Sunglasses Restorer’ reached out to me through my website, asking if I could give them my thoughts on their very cool looking lens and the article that they had recently published. I gave them some feedback and complimented the detail in the article. (https://sunglassesrestorer.com/oakley-cycling-sunglasses/). The concept here is about much more reasonably priced replacement lenses for your Oakley frames. They then asked if they could send me two sets of their lens to review. They gave me a choice. The two that I requested were the ‘Oakley Replacement’ Lenses in a Fire Iridium, and a set of the Jawbreaker Photochromic Lenses in Grey, both at a reasonable $29. They arrived quickly and I was able to use them that weekend on my ride. I put in the Standard Fire Iridium Lenses first. They looked great, a real contrast against my white frames - the lens have more of a red colouring than in the photos online so a great contrast. The lens also seemed to fit into the frames a little bit snugger than my genuine Oakley lens. This may in fact be due to wear and tear of my Oakley lens but I’m not sure. I wasn’t surprised to find they did the basics well – eyes felt protected from the elements and managed the bright conditions well. More technically however, I did find they made images darker, more like your traditional sunglasses than the variable light image I get from my Oakley lenses (which vary the light in the image depending on how strong the light). But let’s not forget the cost here! Also the edge of the lenses (the peripheral vision) doesn’t seem to refract the light that smoothly but I do feel this is somewhat minor. I also used a set of the clear lenses. The timing was perfect for my review. I was hit with a few weeks of rain and terrible light conditions. We had a week where I saw no sun. This is where the clear lens come into their own when there is such poor light that all you want is the eye protection, over light tint. I used them a lot www.sunglassreplacement.co.uk. Location: Tobago of Trinidad and Tobago, Caribbean. Team: David Reece, Cameroon Foster (Guest Rider), Lewis Ball (Guest Rider), Declan Hudson (Guess rider) and myself. ‘So… Tobago hey… it’s that like on the other side of the planet’. Most conversations about this race started will this question/statement! To fill you in, while on our family holiday in America a week before flying out to the Tenerife race, I got a call from my teammate David Reece. The team hadn’t been accepted for the race in China that we had wanted to do but there was now a new opportunity to go to Tobago to race a 5 day stage race. Well why not?, the only issue was that I had to think through starting Uni for a week and then disappearing. I would go to University at the end of September for Freshers’ week (the well-trodden week-long drinking festival for the novice student); then do one lecture on the Monday before flying out to Tobago for 8 days. Freshers was a blast, but I can’t publish those stories, definitely not on here! On the ride out to the Stage 1, the first race, we all realised our first challenge - HEAT and HUMIDITY! It was 27 degrees at 5am in the morning and by 9am it was 35 degrees and climbing. I’ve been fortunate enough to inherit a ‘ginger gene’ from my dad which meant I was going to be the colour of a strawberry for the following few days! On way out we all tried a few efforts realising for me that level of heat without acclimatizing for it was sapping everything I had - it felt like trying to breath in jelly through a straw - nice. The course was rolling and I struggled all day managing only to take 30th or so, having one of my worst days on a bike ever. Cameroon a few places ahead and David a few behind. With Declan's move off the front getting caught with a few miles to go. As you can imagine my mood wasn't great. But head up, I went for a swimming in the Caribbean sea to cool off. Stage 2 was 5 laps of a 12 mile circuit with a very nasty climb in the middle of it each lap. I was feeling a lot better which was a surprising turnaround – ‘less jelly, wider straw’. The course was fairly uneventful, rolling for the first 6 miles, and then you were hit by Orange Hill. The climb started at the top of a rise, turned left up a back road drag. I was still in the big chain ring, the whole group still together of 86 or so and we were 3 meters wide……….then it got messy….it turned right over a rain track in the road that you had to bunny-hop over! and then rolled onto then 2 nasty uphill kicks at about 25% gradient for 200 meters. At the top it dropped straight into a descent that was short but really steep, taking you from 16 mph to about 45 mph before going straight back up again in a U shape, this time hitting a mega 33% gradient to crawl over the top. In the space of about 1 minute the speed changed from 13 mph, to 16 to 45 to 8 and then back to 35 as you rolled down the other side onto the descent. Needless to say after one lap the group was down to 30 riders from 86! I had hung in there and stayed with them. After 4 more laps the group was even smaller and I bagged 19th and was alive (always a bonus). Declan, Cameroon and Lewis had struggles with the heat and mechanical and didn't have the best of days. David was a few moves behind mine taking a top 30 placing on the day. Stage 3 and 4 were both similar – lots of laps, lots of corners. Stage 3 was 50 laps of a gritty circuit which I was able to get round but I suffered. It was almost an exact rectangle with 4 slow 90 degree corners and 4 straights to sprint into. 200 corners later and I was on my knees and was the last finisher that day (about 31st). Stage 4 was about 60 laps of a 1km loop with a rolling hill which was fine as it was a little more flowing but the heat had come back to get me reaching a massive 43 degrees in the race. With only 5 laps to go there was a big pile up and the race was halted, in common fashion for the week. But THEN ! just to add some spice we had a tropical downpour introducing the prospect and actual reality of aqua plane-ing; as the course was covered in white road markings it made it really spillary (is that a word – I think you get what I mean?). It poured for the 5 remaining laps meaning that the bunch split apart completely. It came down to who was prepared to risk everything I wasn’t. Most of the remaining riders took some air out of their tyres – a number of the South Americans didn’t! I lost my nerve and only came away with 19th in the end (alive again though!). Then came the day of reckoning! Stage 5 was positioned as by far the toughest - an 80 mile loop of the island with 10 climbs and estimated finishing time of over 4 hours. We had to leave our place at 7 am to ride 40 mins to the start of the race and then start at 9am. The race was thankfully on a cooler day - only 30 degrees with a low of 27 degrees! (arguably autumnal). However in the first 20 mins I jammed my chain and had to get off before frantically racing to try to catch back on as the bunch rolled along at 28 mph, unfortunately passing David who I later found out had just had a puncture at the time and no one was able to give him a spare wheel, day over for him. I did eventually just as they started the climb – a tough start but others were already falling off the back. It was going to be a tough day. After hauling myself to about the 1:30 hr mark I was able to roll off the front on gradual part of the climb followed by 2 others in pursuit of the breakaway. This turned out to be a brilliant move as my group, the break and the peloton would break up on the following climb but at least I had a 2 min head start on the peloton. The climb was at about 30% gradient for 800 meters and is the steepest thing I have ever ridden, Cameron was on of the riders to turn back at this point with the majority of the peloton, apparently many people climbed off of their bike, simply turned around at and headed back! For the following 3 hours I rode by mostly by myself or at times with the odd few riders. During this time other riders did occasionally move on through or I overtook - there were no flat sections so working together was both impossible and pointless. I dropped my chain again and was unable to restart on the climb so had to walk until the next flatter section to do so. I was in my own world - no one even saw it, you were so alone. A group of 7 riders came past me; they were simply flying up the climbs and descending as if they had nothing to lose, on what were the worst kept roads I think I have seen. I got to the end eventually after being chased by a few stray dogs as I went through town. It was honestly one of the hardest races I have even done. So many more things happened that add to this story but I don't want to bore you. I ended up with 15th in the end. From 86 starters and only about 34 finishers! I finished 23 mins after the winner. What a mess - I could barely stand and had to get 3 chocolate bars and an ice cream on the way home. The race took me about 4 and 1/2 hrs and with 40 mins to and from the race start meant I was on the bike for the best part of 6 hours. Declan was able to finsh 30th in the end, very impressive for his first ever race abroad, especially considering everything else that day. My positions were as follows over the stages 32nd/17th/29th/19th/15th and 24th overall, 27th in the Sprint competition, 29th in the KOM competition, and 5th best Under U23 overall. That evening we attempted to go out to the club with the local riders but we're were all far too tired to attempt anything. In the end we called it a quiet night in and the next day went on an amazing glass bottom boat trip around Crown Point (the end of the island that we were staying on). We saw the Caribbean reef, and an island shelf with different sea temperatures separated by just 5 meters of sand. I picked up a little piece of coral to take home, that now sits on my shelf at Uni. We flew home on Tuesday evening, landing on Wednesday afternoon and I get myself back into Uni. Quick turnaround and off to the ‘Wet and Wild’ (Watersports) event, where we (my flat) made up a new snorkeling club as a reason to be out. We out-chanted the rowers and the swimmers all night. The clubs you can create to attend social drinking! weeks off before hitting up the winter build back into the season next year. Overseas again which I have loved this year. Getting good at the routine…………the standard pack up, fly out, transfer, check in, un-pack and have 2 days to get ready to race. Not sure I’m falling in love with bike boxes, weight limits and Luton and Gatwick airports at 4am in the morning – travelling on a budget is the only way to make this work. We rocked up with a team of 7 - Daniel, Dave, Adam, Cam, Rob, Lewis and myself. Mostly familiar faces, some last with in Albania! It was set up very well with the organiser supplying cars, hotels on the cheap and fully closed roads for the 4 days as well as organising countless numbers of volunteers to close roads, run medical vehicles and I’m sure many other countless tasks. Day One/Stage 1 began with a team presentation ceremony before a hard 28 mile around the flat local streets of one of the towns. We lined up well but the race was split to shreds within just 3 miles after a fast start and a combination of tight corners and hard bottle necks. Gulp!. The pack reduced from 86 to just 29 and it stayed like that until the end of the race boiling down to a hectic bunch sprint. I was there or thereabouts but more thereabouts………..I got boxed out and end up with 24th. Not the best but no time lost on the overall. Daniel had been just ahead of me, while the others had all been in the group behind and had lost a bit of time. Stage 2 on Day 2 got spicier. No chance of a routine. It required an early start as we had to travel to the next island ! We were up at 4:50am. Even before the race things were eventful. In the warm up at slow speeds around the car park I hit scrapped on something and cut the back of my finger open causing blood to go all over my hand, just before a in chase a massive day of racing – why? Who knows – maybe I was still asleep?. I ripped of the flapping skin and got the medical team to wrap it, insisting the whole time that I needed to warm up and was much less bothered about the marginal gains they felt they could achieve for me by meticulously applying the plaster - #marginal-gains #Spanish. The stage involved 2 climbs, one was 6 miles with the second beginning just over 14 miles. The whole day was 40 miles. I was still in the group at the top of the first climb but lost touch on the way back down because unlike some others I valued my life a little bit more, simply not able to descent like the fearless Spanish locals. I climbed well on the second climb but knew I was losing time to the main group. I got to the top of the second climb with then the remainder of the race being 14 miles of descent. I was just bleeding time - I lost my nerve on the violently windy descent and rode slower. I was getting blown from one side of the road to the other with my front wheel feeling disconnected to the bike, choosing its own lines. Daniel, who started the descent about 3 mins behind me flew past me, commenting at the end that ‘if your rode down the middle the wind would probably stop being so gusty before you went off the road! He finished a minute in front of me. I had lost 14 mins to the winners over just 2 hours and 17 mins of racing. Dan had managed to clock in the fifth fastest, his descent on the climb averaging about 39 mph for 10 miles and topping out at almost 60 mph in windy conditions. Fair play. The race had been brutal for all of us and unfortunately due to the time-cut rules Lewis, Dave and Adam had been cut from the race along with about 17 others and were not allow to race the following days. A very tough outcome and I felt for them, and then admired they way they handled it and carried on their interest and support for the race. Stage 3, Day 3 wasn’t very inventive but definitely brutal. It was 31 miles long, 30.5miles of which were up Mont Tiede, a volcano (summit at 3700m above sea level). Just painful. From the bottom the pace was high and a little choppy. I tried to maintain a steady power as the group reduced one by one, with teammates and competitors struggling alike. Rob and myself stayed in the group way over the halfway mark but once we started to get up above the tree line the oxygen started to drop slightly we started to struggle over my Spanish counterparts. First experience of effects of thin air – bugger! Rob and myself yo-yoed off the back for quite a while both taking it in turns to struggle and pull the other one back in. Eventually I came off better, able to push just a little bit harder over a flatter section of the climb. I was able to maintain a steady power, rarely below 320 watts and finished 9 mins behind the winner. Let’s just say we had definitely bitten off more than we could chew with this Tenerife Tour! Getting a top 10 in any form was definitely out of the window. Stage 4 had 2 climbs. The first was about 14 mile, the second was only 4 miles. This time I decided to have some fun after being told that the first sprint mark of the day was only 1.5 km (1 mile?) in. We had been told it was flat for 2.5 mile so I went for it hoping to take the sprint points and at least come away with something. However it had been mistranslated to us and the mark was actually 5 miles into the stage, 3 of which were up the climb. My sprint line at 1 mile wasn’t there! F*&k!. There ended up being a few good videos of the attack though. I didn’t make it all the way to the real sprint line. I paid for my efforts on the way up the climb suffering more than I normally would and being gapped about half way up. As a heavily reduced field went up the road I was in a group with Rob again and we worked together to try to maintain a high pace. I lost contact with this group just over the top of the climb and on the descent, but was able to get back to into a small group at the bottom of the second climb and caught up to Rob after he had dropped his chain. Between the group we pushed on to the finish which was all slightly downhill. With Rob and myself having a drag race to the line for bragging rights and 29th place! I nipped him or it, and believe me I won’t let him forget it! Dan rolled in a few minutes later, with Cam a little way behind him. There was an awards ceremony, but we weren’t up for anything after our experiences across the team. We headed back to the hotel and spent the next two days at cafes and in casinos when not on our bikes. I took home more money from the casino than I did from the bike race…...maybe the world it trying to tell me something after all. I have to admit though that these are great experiences. Trinidad soon – less volcanos I think but I could be wrong – geography not my strong point. Currently I’m in Tenerife for the Vuelta a la Isla de Tenerife, a 4 day stage race in the mountains. Back to the sun it’s 27 degrees at the moment, perfect for me. After an okay August of racing in the UK I’ve been looking forward to getting back to racing abroad thanks to the Lewis Balyckyi trust fund. During this race we have a 7 man team which we are looking for fight for the Gc as well as individual stages. My self I’m looking to get a stage win and trying to contend the gc. It’s mega hilly over here to should suit me. Over the month I’ve been concentrating on training for this event as well as the final foreign race of the year at the end of September, looking to hit a peak for both of these. With my coach Roy Holmes altering my training towards these targets my training has changed slightly mainly consisting of longer efforts and more multiple shorter efforts. Varying the training helps me keep motivated to hit these targets. Only a short blog for now and it will follow with an update at the end of this stage race as well as daily updates via social media. Thanks to the Lewis Balyckyi Trust Fund for supporting me this year and getting me to all of these international races with still more to come. Also to all the sponsors for the kit enabling me to compete with all the equipment I need. 2018 has been a busy year for me. Too busy to keep up this blog in fact. With my finals at university, balancing racing and revision was quite enough on my plate. And when I did hit my essay deadlines, the last thing I felt like doing was more writing. The start of the year went well with a strong team display at the Tour Ta Malta. I surprised myself with 12th in the prologue and a 5th in the queen stage. I managed to come away with 5th on GC, but more importantly the strong had been dominant; two stage wins and 3rd overall. Our confidence was high as we came back to get stuck into the domestic scene. I took a podium at the Sloan Trophy up in Northumberland and managed fair rides at BUCS RR & Chorely GP, two target races for me. 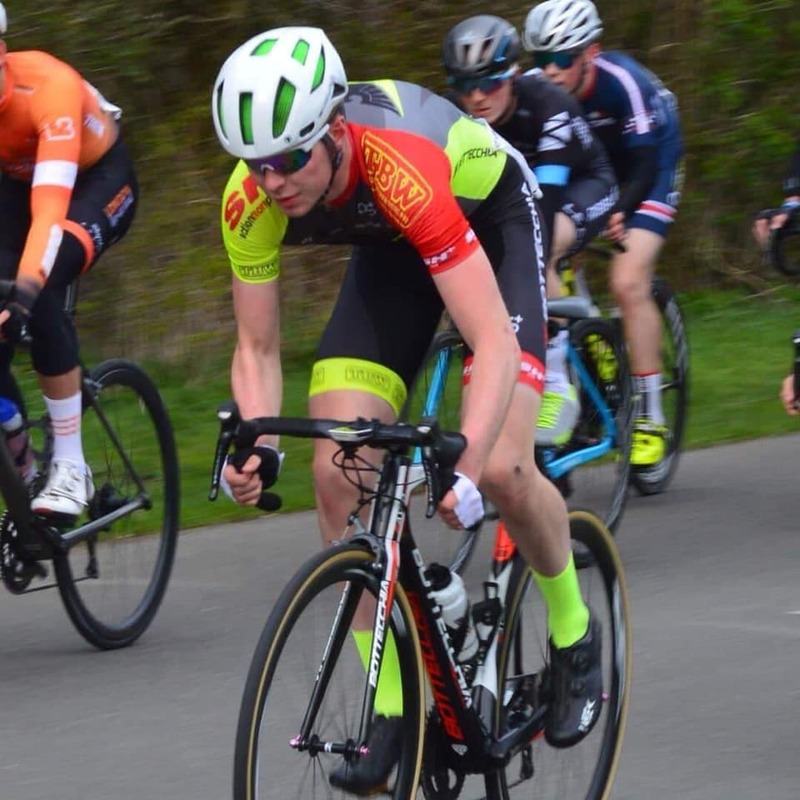 Whilst studies took a priority throughout the spring, I did make the most of the brilliant Chevin Cycles Evening Road Race Series. but still didn’t see any breakthrough results on weekend road races. As I finished my studies I could finally look ahead to a four-month stint back in Belgium with Goma Dakwerken cycling team. Unfortunately, in my final preparations before I travelled over, I crashed on a gravel road out training. I took a sizable chunk out of my left leg, just below the knee. It went down to the bone, and although I didn’t know it at the time, had severed my patellar tendon. All I did know was agony and struggled to communicate with the emergency services on my mobile as I couldn’t stop screaming. I was extremely fortunate to be found shortly by several drivers who spoke on the phone and helped get me out of the road. One retired fireman who had a first aid kit in his car, calmed me down and warded off flies from the wound for 50 minutes before the ambulance arrived. I will be eternally grateful to the kindness he showed me that day. After some time in hospital with the initial surgery and several courses of antibiotics, I left fixed in one regard but feeling broken. The surgeons had done an excellent job of the mess I’d made but the tendon itself would take months to heal, not to mention build back the strength & muscle mass in my left quad which had wasted away considerably over the period in hospital. All previous plans for the summer were abandoned and I’ve been wasting away the days bronzing in the heatwave, watching the world cup and hitting the bench press in the gym to let off steam. I have made good progress with a physiotherapist: from learning to walk again, to building up to easy rides and weight-training in the gym.I’ve been extremely blessed to have the support of friends, family and teammates throughout this period and I can only hope to repay their actions with loyalty in the future. The time off the bike has been tough mentally but has also given me a good opportunity to have a long think about what I truly value in life, much of which I’ve often taken for granted, and what I want to achieve in the future. Certainly, there is more fire in the belly than ever before, and although the wheels on my bike may be stationary, things are already in motion for 2019. I’ve got more ambition than ever, and I’ll be back. Course: 60 miles, narrow and technical round Bristol Cathedral city centre, crash barriers everywhere! The Bristol GP was a city circuit National A, a big event and my first Premier event of the year. It was going to be the fiercest competition I have ever faced, with many turns into which you brake hard and then accelerate hard for about 3 hours! It got worse though because a one hour delay to the start of the race (due to problems from safety inspections) meant that the start would be gridded like a grand prix – guess which of us were at the back of the grid. Continental Level Teams were at the front. The 60 mile race was decided on the first corner!, no chance of catching up – they had created a gap by having a free run at the first lap of nearly 1 minute. The Continental Teams were attacking each other while the rest of us were still clipping in on the start line. I gave it everything but it wasn’t enough. I got pulled out with 5 of 18 laps remaining but was by means the first but nothing counts if you don’t finish. I was exhausted and felt cheated. Course: 115 miles, rolling and then technical onto a city circuit crit. A 115 mile Premier event. An overnight trip got us up there after a night at Andrew Hillman’s – thanks Andrew. The race was set to be 8 laps of a big circuit and and then 6 laps of a little circuit – all straightforward…………..but not if you have a massive crash 20 mins into the race requiring ambulances. The race had to be stopped for 2 hours. I was very close to being in the middle of the mess, with a guy falling infront to my right and another falling infront and to my left. I pulled the brakes, then realised I had slowed too much and was going to hit both guys as they fell in front of me! Just before we all collided a guy hit the back of me, punting me forward through the gap. Then the two from either side and the one who hit the back of me collided together. I got through the space. Twenty racers had hit the ground in total, 7 didn’t get up immediately. Everything from cracked frames, a chainring to the leg, cracked ribs and an ear being glued. I was pretty freaked for the next 2 hours and didn’t race very well but did hang in there. The average speed was between 29-30 MPH, with the flats and the downhills being between 36-42 MPH! I rolled in at the tail end of the bunch. I finished 62nd. Pretty disappointed that I had freaked out so much but on reflection I can see why. Site of a famous civil war battle – a lot of brown signs but not much gunfire! We got up at 6:15am on Sunday morning. It was my birthday. Surely a bit of luck please. I decided to keep it small! Only 50 miles, a Regional A race. I felt great and raced aggressively. My first race as a nineteen year old (which no-one seemed very bothered by?!) I did miss the key break towards the end of the race and ended up being the one to led the charge. I worked my socks off and brought the gap from 35 seconds to 11 seconds. I was still able to take second from the bunch in the uphill sprint to the line, which I was pleased about. I am gradually getting better at sprinting and this sprint-climb combo was a new one - fortunately I did well at both. Get me ! I went home happy 7th out of 70 knowing that the legs are good - just got to nail the tactics now. And I got some prize money. The sun has gone for many but not for me, as at the end of August I’m off to Tenerife for the Vuelta de Isla Tenerife. This is a 4 day stage race consisting of 5 stages, after that I’ll be back home for 5 days before jetting off to China for the Tour of Poyang lake, in my eyes one of the best races in the world! I can’t wait and using the month of August month to prepare to try and make sure I peak for these races. Also a few big British races beforehand. July had been up and down for me with a few crashes and few good results. First solid results was the National A Leverhulme Grand Prix. Quite local race me on a course I’ve not ridden I was looking forward to it. There was some decent riders there so was prepared to have a tough race. From the gun there were attacks going off and after about 3 Laps the winning break went which I missed as they countered my attack straight over the top of me. This break has 2 super strong riders which were hard to bring back. But I reset and tried to get into a counter break which I did. With a pro rider and 3 others, the five of us managed to get out of sight. The hard part was yet to come for me with the jumping around, my weak point in cycling. 4 Laps to go it started, I was able to close what I could until a rider from vitus pro cycling jumped around me into the headwind leaving a gap I just couldn’t close. I was then left riding around on my limit wondering if I was going to get caught, luckily for me a group of 3 came across to me and I rode with those guys to the finish for a 12th place, a hard race for me not being suited to it but I was happy with how it went and how the legs were. Another good race was the Colne Gp. I enjoy this town centre circuit as it fast and flowing which for a crit is good for me rather than the tighter ones. With the help from my coach he gave me advice on what and when to do it so I was ready to go knowing I was strong enough to win this race. Was fast from the start but I was feeling good, sat in the middle of the bunch waiting for my time, 11 minutes in I went down in a crash just before the finish line, someone threw something onto he circuit I heard? Foolish and ruined my race and many others. So I was out and that was that but luckily both myself and my bike were fine. Now I am going to be doing a solid block of training with some target races aswell as the longest National B road race in the country this month before heading abroad. These should help me prepare for longer stages on the bike and the repeated daily races. I do think stage races suit me much more than one day races, and having the experience from racing China last year I know what to expect both race and food wise, I will be taking a suitcase of my own food as I don’t want a repeat of last year to loose 8kg in a week from Illness. After China I hope to do some more racing in Asia but we will see. I’d love to end the season with a few foreign stage wins to help me secure a team for next season. That’s my goal and helping me achieve this are The Lewis Balyckyi Trust Fund who help me get to these places, my coach who helps prepare me physically and all the sponsors of my team who supply me with all the equipment I need to race at the top level. All I need to do now I win. This entry was posted in Uncategorized on July 30, 2018. Have you ever pushed so hard you threw up and the only thought was to keep pedalling! Back last year, the first conversation with the Team manager, Jason, I said I wanted to ride the U23 National TT Championships – the biggest TT race I would have ever competed in. I have always liked a Time Trial (and the pain it brings!) and the opportunity to compete at that level and see how I stacked up against the best U23s in the country. Due to the nature of the National Championships the TTs are held on the Thursday as the Road Race is on the Sunday. Northumberland is a long way away from London and the mid-week time meant I had to rack my brain and ask for a few favours just to get to the start line. Dave Reece, my team mate made it all happen with my parents getting me to Liverpool, where he lives, on Tuesday night (their trip alone was 8 hrs round). Dave had agreed to take me up on the Wednesday. So that I could ride the course the day before. We arrived around 4 o’clock on Wednesday; unpacked and got going on the recon laps, finding out about the flow of the course and the bits to watch out about. The course rose up from the start with a few lumps and bumps before taking 2 right handers at the top of the course and heading down hill with some nasty 90 degree corners to be taken at speed, before re-joining the course to start the second lap. Without this knowledge you will be in the wrong gear, brake at the wrong time and possibly turn the wrong way! After the recon laps, Dave and I headed to the worst B&B we have ever stayed at. It came with loud water pipes which made noises all night and no breakfast in the morning… some Bed and Breakfast! Dave and I worked it out as best we could. I bought breakfast for Dave as token compensation for his bad night which ended up with him sleeping his car because of the relentless noise! Apparently I’m not allowed to pick places to stay anymore…. Sorry Dave. Once at the race HQ I set about making sure the bike was UCI legal. This is the stress of making sure your bike fits within the boundaries so that everyone has an ‘equal’ chance and no one can be stretched out or use silly positions to gain an unfair advantage, however the specs are the same for anyone below about 6’2”. This means that a woman of 5’2”and a man of 6’2” are limited to the same reach on the bike even if they are completely different sizes. Personally I was told that if I pushed my saddle back 2mm I could move my bars forward 50mm. Margins, margins, margins! A few hours later and the position were sorted and I was legal. I had got lucky, mine was quite close to the requirements however others hadn’t had any forward planning and had hack saws out with about 25 mins before their events! I blocked it out and got on with my warm up. My Grandad had ‘popped down’ from Scotland to watch at the event and this made for a nice dynamic. He saw somewhat of a mad world of TT which you don’t have with road racing and I think he was somewhat perplexed by it but he said it was very interesting and loved the fact that I was racing in it. As I warmed up, I thought I’d be sensible this time and I put on sun cream (Mum would be proud!) Arms, legs, neck… nailed it. I then rolled my skinsuit down to my waist and warmed up. Skinsuit then rolled back up for the race. The bit I hadn’t remembered was that my skinsuit was really thin over the back. Consequence…………….I currently have 2 semi circle burns on my back where the skinsuit is double stitched, the stitching covering the only bit that is still white. The rest is bright red and it hurts to have my back against anything! Back to the warm up……….all was going well and I was coming to the end of the warm up and as I did the last effort the chain popped off the Chain Ring, I looked down at it, I had popped a link in the chain. It was about to snap! F*ck! I got off the bike and humbly went over to the world tour Pro Alex Dowsett! He was kind enough to help me sort it out with the help of Ashley Cox and his Dad. They told me to go and get ready while they pulled a new chain out the plastic bag and got my bike working with 20 mins before my start time. Scary stuff. Very thankfully to those guys for not only helping, but being so calm, collected and generous. Great people. I headed to the start, bike passed the UCI jig test, waited and then off…..DOWN THE RAMP…….only to find that my Garmin had changed bike setting! I managed to sort it out while riding. If only my biking life was easy but heh I’m learning a lot, very quickly this year. Off on the course, took the 2 right handers at the top before shooting down the descent and spinning out massively – bugger! Then some nasty right handers, before starting the second loop. I had been getting hotter and hotter as the ride went on. As I came to the top of the course for the second time I threw up onto the bike! Urgh! All I could think was to keep pedalling! Grim. I kept my nerve and continued onwards, pushing the whole time. As I finished the second lap I had 3km to go and I felt like I was falling apart the whole way to the end. I had pushed 360 Watts for 40 mins, taking 32nd place on the day. Mixed feelings. My best numbers for a 40 min TT, but losing 4:01 MM:SS to the winner (but only 2:30MM:SS to 3rd place). I definitely learnt a lot and realised I had missed a lot of little tricks. Things like chain rings sizes, UCI positions, white skinsuits over black, maybe thinner overshoes, etc., and I found out that most riders had ridden the course many many times to perfect every 100 yards of it. After the event, I said goodbye to my Grandad and headed back to Liverpool with Dave. His family and him were kind enough to treat me to a northern dish of Gravy and Chips and a night’s rest before getting on the train early the following morning and being home by mid-morning on the Friday. To add to my life’s experience I arrived at Lime Street station for a 4.45am departure to discover that the first part of the trip was a replacement bus service (with my enormous bike box). What doesn’t kill you makes you stronger. I was exhausted. Thanks again to Dave and his family. I started June abroad In Montenegro for the Trofej Kuci stage race. As a whole the race went really well for me personally and for the team, with me finished 11th on the first stage despite there being a climb of 18 miles and 1500m elevation, I managed to time this effort perfectly enabling me and the small group I was with to still have the leaders in sight at the summit. With another 6 mile climb to go afterwards I managed to drop my group and solo to the end for 11th place. Also having 7th and 10th from my team mates left us up there for options for the next day. The next day was again another hilly day, not as servers as the first but still 2x500m climbs. This day was a morale dropping day for me as I was chasing a group in front the whole time solo after a problem before the first climb. I was alone until the line for about 2 hours. Luckily other teams would come beside and refill and feed me in the heat even though the water was still warm. I finished 19th on GC could of been better but after being invited back for the 2019 edition aswell as other UCI races I and my team mates will know what to expect. Arriving home on the Wednesday I had another local stage race the upcoming weekend, the Dave Hitchen stage race. The first stage was round a flat circuit, I went with every move at the begging and needed up being in the break of 16 riders, of which everyone had a team mate expect me. Aware of this and knowing what was going to happen towards the end of the race I pulled through respectively to everyone else despite being moaned at with the words “it doesn’t make a difference” if someone had 4 team mates or 1, where we all know it makes all the difference, Saint piran who had 4 riders started to counter attack 3 Laps to go, going with as many as I could until eventually a group of 5 got away, still chasing I did all I could as a line rider but they managed to stay away, abiut 1 mile I attacked the group and just got caught by 3 riders finished in 9th on the first stage. The 2nd stage was a team time trial around the infamous Pimbo, 2 Laps and all go play for. After stage one my legs where shot with the TTT only being 1 hour after. We began with a plan and thanks to my team mates I made round after they pulled me doing some big turns and managing to finished in 6th. The next day was the 3red and finally stage around a sappy old course brought back into use. Again we had a plan to try and ensure I high position on GC for myself. The race began and a team mate of mine was up the road leaving it all the play for with the GV contenders, on about the 5th lap I was on the front and before I knew it I had a 50 second gap with the rider 1 place behind on me on GC, at this point I thought I might aswell go the win overall than settle for a top 10. By the end it didn’t pay off being caught 2 Laps to go, but I was happy with my riding as a lot of people would of just settled for a top 10 but all I wanted to do was win. You have to lose some to win some. A town centre crit was on the cards next something that isn’t my strong but I thought I’d give it a go. Anyway after attacking 6 Laps to go a managed to ride away and take the win, surprised but happy to win something that doesn’t suit me at all. Good prep for the National criterium champs this month. Through July the racing kicks back off again with Bristol GP, the National Criterium championships followed by Stockton GP and then the elite Criterium series. With some big stage races in Tenerife, China, Tobago and Indonesia I’m hoping for some big results over the next 2 months going into these. A big thanks for the support from The Lewis Balyckyi Trust Fund enabling me to go abroad and ride all these races, without them would become a impossible task. Fund there social media below. Also thank to all the sponsors and my coach Roy Holmes of Holmes cycling. This entry was posted in Uncategorized and tagged cycling, lifestyle, sports, travellingon June 30, 2018. Some extra curricula. Well, if you’re near the border with Albania and have some time to spare, what are you going to do? The night before after the race we were served the local traditional food of goulash, and I was even asked to pose for a photo with the locals, they insisted that I held my Goulash! The organiser had then sorted out transport for us back to the hotel, putting all of our bikes on the back of the broom wagon, and sticking us in the back of the said van for which seats had never been taken as the optional extra. ‘Just hold onto the sides you will be fine!’ We did and managed to get the air we needed ! by Lewis holding open the sliding door with his foot. Daniel decided he would rather ride back to the hotel… not sure why! It was in fact a great laugh; definitely not part of the norm, definitely not UK health and safety approved. At the last hotel we were able to settle a bit more. We were to spend the next 3 nights here. We used the Spa, ate out with our winnings (yes we bagged some money – enough at least for some food) and abused the free buffet in the morning. Food is the absolute must when you are getting through 1000s of calories a day. The day after the race we had all agreed to do a long ride on our Monday. As we were to fly back on the Wednesday and didn’t want our last ride to be a big one, as this can often lead to illness (taking a weakened immune system onto a plane with lots of other people. No the best idea.) So …we rode to Albania! And for good measure and in keeping with the theme of our trip Daniel had found a 24 mile climb to get us there. He wanted to take the KOM. It’s the first ride I’ve ever done were I have had to take my passport with me! Like many of the rides we did the first part was flat and that got us into Albania hassle free. Even able to get stamps in the passports as we went across. Once in Albania the road quality worsened, we didn’t quite realise the difference between the two ex-Yugoslavian nations until we were able to see them side by side. Still ridable, but not the smooth fresh tarmac of Montenegro. We headed to the climb and straight up. Daniel shot up the road determined to take the KOM, whereas Lewis and myself road at a much easier steady pace. Dave and Lewis were less interested in more pursuit of pain and eased off early. The climb took Lewis and myself 2 hours to get to the top. It was a mentally challenging climb as from the start the gradient was shallow but the uneven surface meant the road was slow. The climb was also straight through the valley meaning that the only turns to break up the climb came in the last 5 of 40km. With the change in elevation that meant the temperature also dropped from 31 degrees to around 16 degrees. Which left us quite cold and underdressed. On the way down the mountain we stopped at the first café we came across. It turned out to be the Local Albanian Prison guard’s café! Yep that’s right, we had stopped next to an Albanian Prison. No choice really and no choices around. We had ran out of food and water so were happy to settle for just about anywhere. We walked in hoping for something we could work with. We ended up having to order by walking around the café pointing at other people’s food whilst getting stared at by everyone and not a single word in a shared language ! We ended up with a bowl of salad, 3 rolls and 8 sausages. That was the total of the diversity in the café after all! We ate our meal, constantly watching our bikes as the locals admired them. It then came to paying. Wanting to get out of the place I got up and walked to the bar. On me I had two twenty euro notes and a 500 Albania Leke (about 4 euros). I held out all three notes I had, just thinking if he takes them all at least I can leave… I asked and gestured to pay for everything. He took the 500 Leke. I was shocked so little, he then handed me back 275 Leke, the meal had cost 225 Leke …or £1.57! I tipped him 75 Leke as I didn’t want the change for the rest of ride. His smile was ear to ear. We shot off and got back to the hotel across the border, all alive and with a memory for life.… exhausted. Before we flew back we were invited out by the local cycling club for their weekly BBQ and by the organiser for a meal out with his family on another. Really good friendly people. Our last surprise would come as we headed home. Packed up and waiting for our transport to the airport. This turned out to be the same broom wagon the race had used. We had assumed it would turn up with another car to transport us, as the broom wagon was just a transit van after all. But no, just a 3 seat transit, 5 of us, 1 driver, 5 X 30kg bike boxes and 2 X 20kg suit cases all with wheels. We ended up, 4 of us in the back of the transit with all the luggage and in the pitch black and 27 degrees outside. For 10 miles he bounced around over rough roads with all the cases in wheels, eventually arriving at the airport. As the driver pulled up he stepped out and had look directly at two police officers, then walked around to the back of a white transit and unloaded 4 people. All of us clocked the policemen, not an issue at all. Only in Montenegro. An amazing country well worth a visit. The suns finally arrived! Makes riding the bike so much more enjoyable, plus you get a nice tan! So May has been a busy month, leading up the last race which is my target for this month in Montenegro, the Trofej Kuci stage race. To prepare for this I’ve had a 3 week training block from my coach Roy Holmes with varying training sessions aswell as a couple of races added in. One of which was the Jack Campbell memorial up in Scotland. Doing this race last year where I came 3rd I knew and liked the course so was hoping for the top step. Again it was 24 degrees and blue skies but with the course being in the open it was quite windy. Warmed up and ready to go I places myself right at the front ready to start in with action from the gun. A few attacks went but I knew that the climb coming up would be where something if anything would manage to get away. With a KOM cash prize I first of all set my sights on that, about 1/4 of the way up the climb o attacked bridging across to 3 riders and going straight past them for about another 2km to take the KOM. First goal achieved. Next I took a look behind and couldn’t see anyone apart from 2 of the 3 riders, so on the descent I waited for these and then we pushed on shortly being joined by another 4 riders. This ended up being the break of the day, on from this was another cash prize being the Sprint. Again I wanted this so placed myself okay but on the front slightly to early but I still managed to put enough power down to make sure no once could come past me, YES I WON A SPRINT, a rare occasion for me so i quite happy. Soon after that a neutral service car came into the gap between us and the bunch so we could relax a little. We pushed on working together until the decent after climb where some traffic was ahead, this really slowed us down with one rider over taking the lead car, Instant DQ. We sat up thinking we would get caught but still no site of the bunch, I thought to myself just my luck for this to happen but not this time. Anyway I came to last 4/5 mile and there were 6 of us left. People start to miss turns which left only of us still pushing through, we turned back toward the finish for the last 2 miles and we started to attack each other, I managed to close 2 down but instantly got counter attacked until I couldn’t close the gap, I kept fighting but rolled across the line in 4th place. Happy enough but wish I didn’t do as much work earlier on. On from this I was ready for Montenegro! A country I’ve never been to but with a prize pot of €5000 I was more than happy to go, and supported my the Lewis Balyckyi Trust Fund was made even easier for me to take this opportunity up. I arrived yesterday Wednesday 30th to a lovely 30 degrees. A very scenic country with some mega climbs of which we will be going up during the race. A international field which our team does not know we are yet to see the competition, but with the prize money being good we know it’s going to be hard. A lot of climbing, sun and bike riding what could be better! I’ve had a good month and good preparation with Holmescycling so I’m ready for this race. Another shorter update will follow this one about the race so keep your eyes out and thanks for reading. Thanks to the Lewis Balyckyi Trust Fund for making things happen!